Last weekend when I attended Dan’s Taste of Two Forks in the Hamptons, I planned my visit around the Forks of Long Island by hitting the best stops whenever possible. One of them was Tate’s Bakeshop in Southampton. Why? 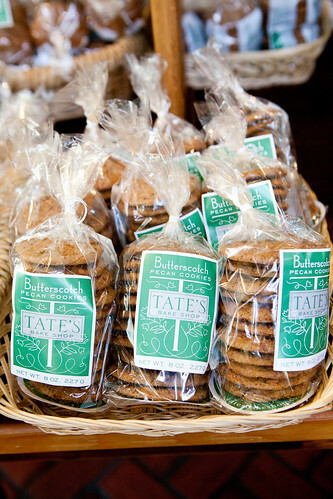 I am a fan of Kathleen King’s (the owner/founder of Tate’s) über thin chocolate chip cookies. I’ll get into detail later since I brought a whole bunch of them back home. 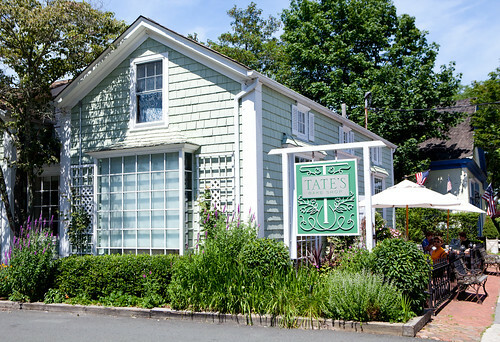 When you drive to Tate’s Bakeshop (it’s impossible to get anywhere without a car out there), you’re greeted by the pastel blue-green, upscale yet charming country storefront. 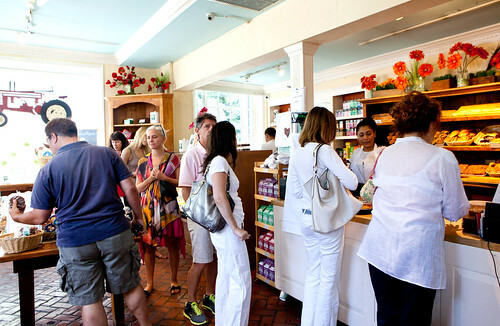 Entering in the large store, it’s bright with a simple layout divided into two main sections – Tate’s all-natural baked goods and favored companies’ goods (e.g. 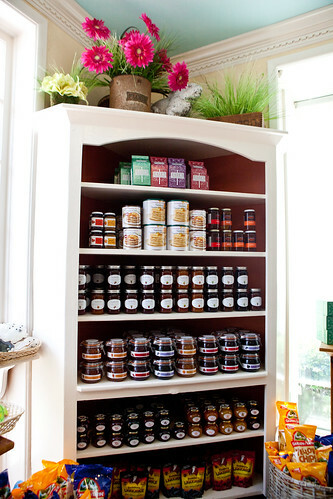 jams, pancake mixes, etc.) and their espresso/drink bar to pick up after ordering. 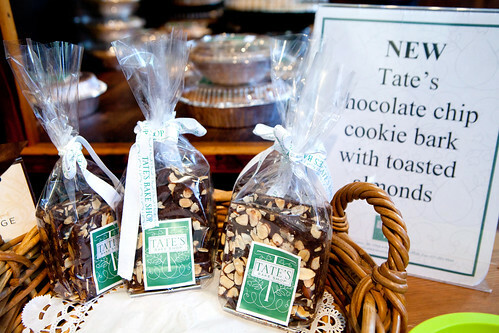 Around the time of 1 PM on a weekend, Hamptonites and tourists alike waited in line wrapping around one of their large center display table of Tate’s signature cookies, bar cookies and brownies. This would be my equivalent of a weekday rush lunch hour in Manhattan except it’s a much more inviting atmosphere and it’s all for the sweets. What amazed to me the most about Tate’s was the dizzying array of sweets and pastries sold here. It runs the gamut from fresh, buttery croissants and artisan breads sold at the counter to pies, muffins, coffeecake, brownies, a rainbow of decorated sugar cookies, and of course, her famous chocolate chip cookies and its many varieties of that cookie. This shop would definitely entice the person who is craving very good American style desserts. Before I was about to hit the road, I ordered a pair of cappuccinos and a large iced passion fruit roobios tea for myself and my friends. The cappuccino was robust and dark, though I never thought of thinking or saying it, I really liked the whole milk used in the foam. 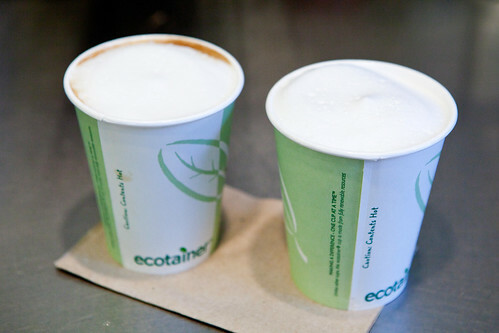 It’s a lot richer tasting than what I expect or normally encounter from many coffeehouses in Manhattan. I tried a sampling of the decaf mango tea which was wonderfully mango-y and it’s pleasantly sweet without any sugar syrup. 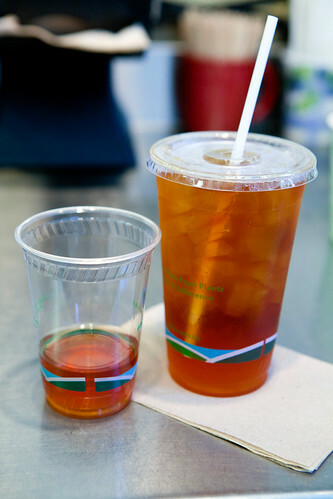 My friend’s roobios passion fruit tea was wonderfully floral-tart from the passion fruit. 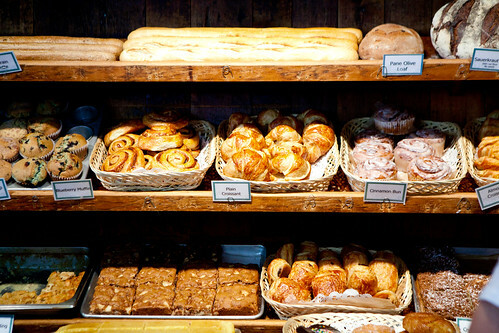 As this store is to-go than a sit-in bakery, I brought a whole bunch of sweets back home. 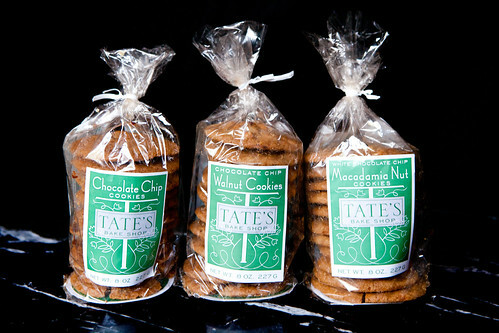 The three packs of Tate’s signature cookies you see above are chocolate chip (the famous flavor), chocolate chip walnut, and white chocolate chip macadamia nut ($5.25 each; all prices indicated here are based at the retail store, not their online store). All of these cookies have the famed crispy, thin, caramelly characteristics and they are my equivalent to potato chips. (Meaning, I can’t stop eating just at one cookie.) My personal favorite is the chocolate chip walnut. The bitter walnut gave it a greater depth of flavor compared to its famous sister, chocolate chip. The macadamia nut was good and the nut enhanced the buttery flavors of the cookie. The sour cream coffeecake ($16) was arguably the best coffeecake I’ve eaten in a long time. The cake was finely textured, incredibly tender, moist and feather-light despite its hefty weight. 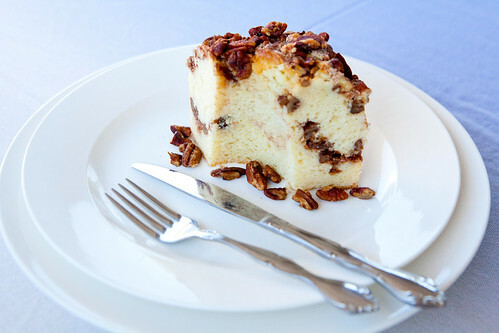 It’s layered and topped with coarsely chopped pecans and cinnamon sugar making it a delightful cake to have in the morning or any time of the day. 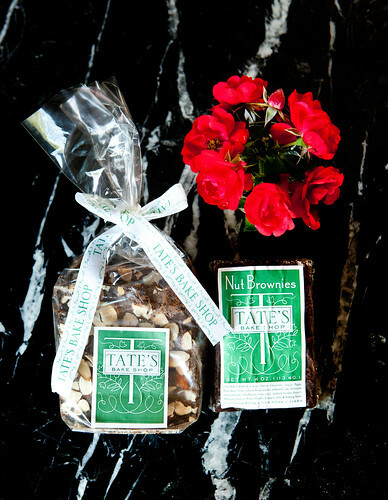 One of Tate’s newest product chocolate chip cookie bark with toasted almonds, it’s pretty intriguing to have. It tastes like a chocolate almond bark but you’ll discover the signature crisp, buttery chocolate chip cookie center. It’s very good but since it’s ridiculously hot in New York City, I’m weary of chocolate melting in my hands. (Chocolate bark is hand food…). As for the nut brownie, it’s fudgy, dense and chocolately studded with the right amount of walnuts – the kind of brownie I love to eat. 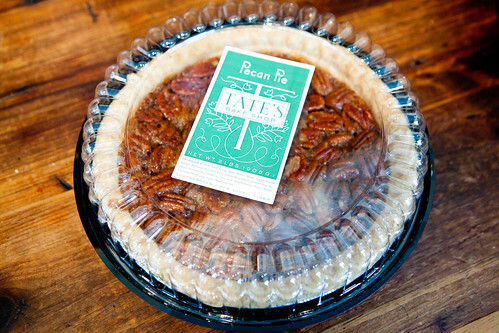 I was curious about their pecan pie (9-inch, $16.95) since I don’t hear much about pies from this company. 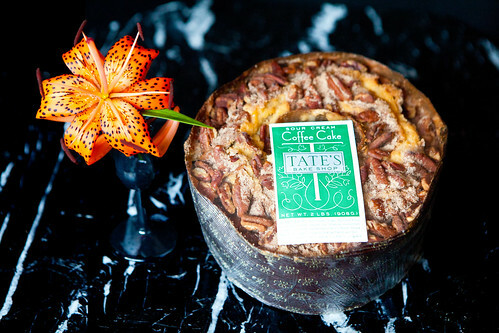 Again, Tate’s has exceeded my expectations and bakes a pretty darn good pecan pie. The crust was a pâte brisée that it’s a short, crumbly pastry rather than the delicate, flaky pastry that a pâte sucrée would have. 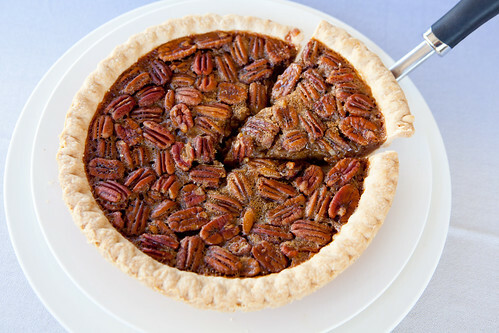 The filling was not too sweet, pleasantly creamy yet chewy and had enough dark molasses flavor to hold up to the toasted extra large pecans. 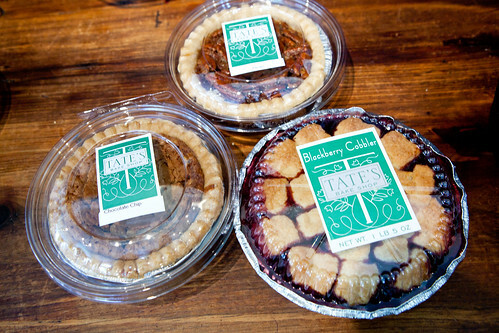 All in all, Tate’s does not fail to satisfy your sweet tooth. The quality of ingredients to the final product that you consume is top notch. 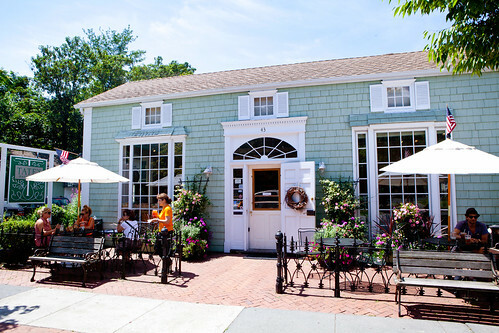 If you ever have the chance to go to the Hamptons in Long Island, this is a must-go destination for very fine desserts to indulge for yourself or if you are seeking excellent food gifts to bring back home.